For the original WSJ link to the article, please go here. Talk about a contradictory Fed Reserve as they drop rates to almost zero for years – which should be unbelievably stimulative – yet the economy remained stagnant all that time. In another attempt the Fed dumps $4,5 Trillion into the economy through QE; still the economy did not respond. The one area the Fed Reserve’s FOMC and BoG have not even considered is the Regulatory and Enforcement side of the Fed Reserve, FDIC and the OCC. This is exactly why none of the Fed’s Monetary Policy stimulants (rates and QE) worked: the bank regulatory agencies of the Fed and others have effectively used Dodd-Frank to shut down normal banking activity. This is irrational Fiscal Policy and it is crippling. The White House is set to launch its search for the next Federal Reserve chief, according to a senior official, and it will be managed by Gary Cohn, the former Wall Street executive who some market strategists believe could be a candidate for the post himself. Officials won’t publicly outline any timetable for their decision or shortlist of candidates. Fed Chairwoman Janet Yellen’s term runs through January, and President Donald Trump didn’t rule out her reappointment in an April interview. Ms. Yellen’s reappointment isn’t an outcome many observers expect because of Mr. Trump’s fierce criticism of her during the final weeks of last year’s presidential campaign. But his willingness to consider her speaks to the amicable relationship they have forged since Mr. Trump took office, observers say. Since taking office, the president and his advisers haven’t publicly questioned the Fed’s actions—including its decision to raise short-term interest rates in March. The Fed has also signaled it is likely to raise rates again at its two-day meeting that concludes Wednesday. An alternative to Ms. Yellen could be Mr. Cohn, who became Mr. Trump’s top economic adviser after a 26-year career at Goldman Sachs Group Inc. Mr. Cohn has emerged as a key intermediary in the administration’s relationship with the central bank. When publicly asked if he is interested in the Fed job, Mr. Cohn and other White House officials have said he is focused on his current job. But former colleagues said he has cultivated an appreciation for the power of the Fed during his long career on Wall Street and for the institution’s relative freedom during his current stint in Washington. While Mr. Trump’s 2016 criticisms of Ms. Yellen suggested the central bank would face a rough time with the new administration, the president and Ms. Yellen are off to a surprisingly smooth start. Weeks after his inauguration, Mr. Trump held court with Ms. Yellen in the Oval Office. Seated behind the office’s Resolute desk, he told her she was doing a good job, according to people familiar with the exchange. Ms. Yellen sat across from Mr. Trump in a chair next to Mr. Cohn, who arranged the meeting. The Republican president told Ms. Yellen he considered her, like himself, a “low-interest-rate” person, those familiar with the exchange said. During a conversation that lasted about 15 minutes, they discussed how economic policy might help the millions of U.S. citizens who felt left behind during the postcrisis recovery. Mr. Trump’s April comments marked a reversal from last year, when he accused Ms. Yellen of keeping rates low to help Democrats. Mr. Trump and his administration have, so far, opted to stay neutral in public on Fed decisions, a contrast to his administration’s criticisms of other nonpartisan institutions such as the Federal Bureau of Investigation, Congressional Budget Office and the courts. Mr. Trump wants a fast-growing economy, and that means he won’t want the Fed raising interest rates so aggressively that it thwarts any boom. Ms. Yellen, for her part, wants to preserve the independence of an institution that faces more political hostility than at any time in a generation. On paper, the White House and the Fed appear headed for a collision. The president wants to raise the economy’s annual growth rate to at least 3%, but Fed officials think demographic trends and slow productivity growth mean the economy can grow sustainably at around a 2% rate. With the unemployment rate at 4.3%, the Fed would likely accelerate interest-rate increases if Mr. Trump’s administration took steps to lift growth in a way that simply boosted short-term demand. This hasn’t been a problem yet because Mr. Trump’s administration hasn’t managed to move its agenda through Congress. Some observers caution against reading much into Mr. Trump’s silence on Fed policy because the central bank hasn’t done anything to upset the administration. Stocks have moved to record highs while federal borrowing costs have fallen. A likely Fed move Wednesday would lift its benchmark rate to a range between 1% and 1.25%, a very low level historically. But if the Fed takes action Mr. Trump perceives to be threatening, he could become more vocal, said Peter Conti-Brown, a financial historian at the University of Pennsylvania’s Wharton School. “The minute that ‘Morning Joe’ has a report about a Fed action that could harm Donald Trump, set an egg timer and see how long before he tweets,” Mr. Conti-Brown said. Though Mr. Trump and Ms. Yellen were born two months apart in neighboring boroughs of New York City, they couldn’t be more different. One, from Queens, is the brash celebrity developer who relies heavily on his gut, professes little interest in academic expertise and brings a deep skepticism of established institutions to Washington. The other, from Brooklyn, is a risk-averse economist who prepares meticulously for speeches and meetings, has vacationed with suitcases full of books and has spent her career in the halls of academia and central banking. Their placid relationship reflects Mr. Cohn’s leading role. Ms. Yellen meets regularly with Mr. Cohn and Treasury Secretary Steven Mnuchin, who also spent much of his career at Goldman Sachs. Mr. Cohn has emphasized to colleagues the importance to markets of not publicly second-guessing monetary-policy decisions, following a rule established in the Democratic administration of former President Bill Clinton by another Goldman-executive-turned-presidential-counselor, Robert Rubin, who later became Treasury secretary. Mr. Cohn takes pride in convincing Mr. Trump of the economic benefits of respecting the Fed’s independence, including not firing off verbal or Twitter attacks on the central bank, according to people who have discussed the issue with him. Mr. Trump can put his stamp on the institution by filling three open seats on the Fed’s seven-member board of governors. The Fed chairman and vice chairman jobs come open next year. Many Wall Street and Washington observers expect Mr. Trump to select his own candidate for the top job, possibly Mr. Cohn. The harshest criticism has come from congressional Republicans. Many resented the Fed’s extraordinary measures to boost economic growth long after the 2007-09 recession, with ultralow borrowing costs making former President Barack Obama’s deficits smaller than forecast. Republican lawmakers also said the Fed worked too closely with Mr. Obama’s Democratic administration and Democrats in Congress to overhaul postcrisis regulation through the 2010 Dodd-Frank Act. Some vitriol aimed at the Fed may ease once Mr. Trump makes his appointments, senior White House officials said. Fed officials have defended the regulations. “We’ve accomplished a lot. We have a much safer system,” Ms. Yellen told graduate students in Ann Arbor, Mich., in April. Some White House officials believe Dodd-Frank gave the Fed too much power. They are preparing to nominate a Fed vice chairman for bank supervision, Randal Quarles, who served in the Treasury Department of former GOP President George W. Bush, who could favor a lighter touch. White House officials also have expressed reservations internally over the Fed’s postcrisis purchases of mortgage-backed securities—one of the extraordinary measures it took to stimulate growth. Some critics said the purchases amounted to fiscal policy by determining the allocation of credit in the economy. Mr. Trump’s administration is considering nominating Marvin Goodfriend, a respected monetary economist who has articulated those reservations, to the Fed board. These concerns haven’t been aired publicly by the administration, in contrast with Mr. Trump’s comments during last year’s election,when he said Ms. Yellen should be “ashamed of herself” for keeping rates low. This entry was posted in Economy, FInancial on June 28, 2017 by admin. Here’s a shocking revelation: bank owners don’t like to take loses even more than regulators. Know why? Because bank owners put their own money into their bank to capitalize it. Regulators don’t. Yet the current bank regulatory environment has gotten so regulator-driven that Fed, OCC and FDIC bank regulators make most decisions about bank capital. They may be good at regulating, but they don’t have a clue about running a bank and they aren’t expected too. The fact is that both bankers and regulators should live by a set of rules. That does not happen today; regulators make up new rules on a whim, they are not held accountable for their actions and regulatory excess is the major reason for the anemic economy during the entire 8 years of Obama. WASHINGTON—The largest U.S. banks survived a hypothetical “stress test” and could continue lending even during a deep recession, the Federal Reserve said, a strong report card that could bolster the industry’s case for cutting back regulation. In the first part of its annual tests, the Fed on Thursday said 34 of the largest U.S. banks have significantly improved their defenses since the 2008 financial crisis. The results signal that many banks could win the Fed’s approval to increase dividend payouts to investors next week, in the second round of the tests. The outcome gives ammunition to the Trump administration and congressional Republicans who see some of the rules put in place after the financial crisis as excessive and want to ease them in the name of boosting economic growth. Supporters of the rules say healthy banks show the regulations are working, not that they need to be rolled back. The exams are one of several new drills that banks must run in the name of preventing a repeat of the 2008 crisis and subsequent federal bailouts, from liquidity rules preventing a short-term cash crunch to “living will” bankruptcy plans. This year’s results come in the midst of a broad rethink of those rules. Last week, the Treasury Department released a banking policy report that recommended the Fed consider changes to the stress tests. The Treasury report said no firm, even the largest, should have its capital plans rejected for solely “qualitative” reasons. Fed officials are already considering that change. In the second round of the tests, scheduled to be released next week, the Fed typically judges banks’ “qualitative” risk-management practices. The report also said the tests should occur only once every two years, instead of annually, except “in the case of extraordinary events.” It said the Fed should solicit public input on the tests, including the hypothetical scenarios and mathematical models. Fed officials have resisted similar recommendations in the past when they were suggested by bankers, saying they would undermine the exams by making them less flexible. Fed governor Jerome Powell, the Fed’s regulatory point man, said in Senate testimony Thursday that the Fed would solicit public input on how to make the tests more transparent. Mr. Powell said he believes it would be appropriate to exempt “firms that achieve and sustain high-quality capital planning capabilities” from the qualitative part of the exams, meaning the largest U.S. banks could win that exemption in future years. Any broad rollback of rules would take time. The Trump administration has few officials in place at the banking regulators. And efforts to change regulations in Congress must overcome potential opposition from Senate Democrats. Sen. Sherrod Brown, the ranking Democrat on the Senate Banking Committee, said Thursday that policy makers could undo important consumer protections if they push to deregulate too far. “There is no evidence that relaxing rules will lead banks to lend more,” Mr. Brown said at Thursday’s hearing. It was the third straight year the initial results showed all big banks meeting the Fed’s definition of good health. A Fed official said big banks finished the hypothetical downturn with an even higher level of capital than they had before the 2008 crisis began. The more closely watched part of the annual tests occurs next Wednesday, when the Fed will release its decision whether to approve, or block, banks’ plans to return capital to shareholders through dividends or share buybacks. The positive results may also allow banks to make larger payouts than in past years. This week’s results don’t necessarily predict the Fed’s verdict next week. In some previous years, banks have shown strong capital ratios in the first part of the tests, only to be deemed as failing in the second round, which uses a broader set of criteria. Thursday’s results don’t include banks’ individual capital-distribution plans. The Fed said the banks would experience collective loan losses of about $383 billion but still meet its required minimum capital ratios, even in a hypothetical scenario that envisions the U.S. unemployment rate more than doubling to 10% and severe strains in corporate-loan and commercial real-estate markets. Fed officials attributed the positive results to the fact that banks have worked through problematic loans like soured mortgages, while steadily increasing loss-absorbing capital on their books as a result of stiffer postcrisis requirements. Fewer banks are expected to come up short in the second round of tests next week than in previous years. 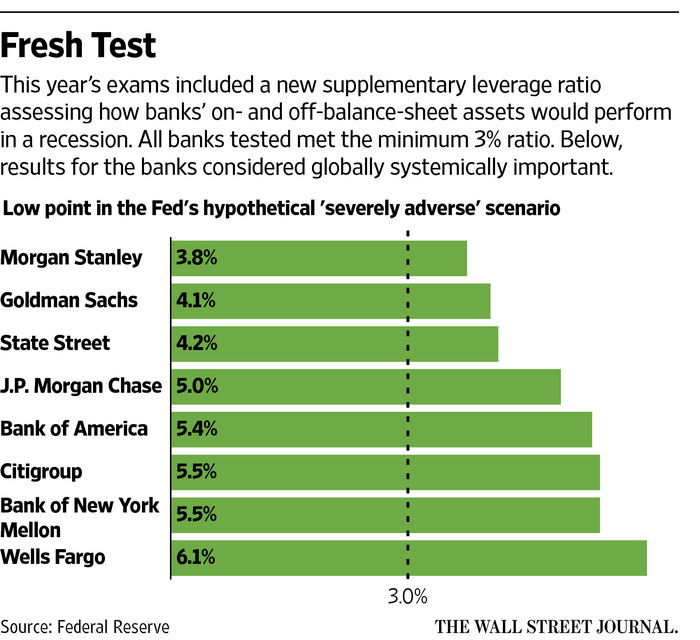 This year, only 13 of the largest, most complex banks will have to take the qualitative exam. Fed officials say that reflects its conclusion that, broadly, banks have improved their ability to track risks in real time. The stress tests were first conducted in 2009 to help convince investors that the banking system wasn’t about to collapse. They are now a legal requirement to force banks to think about the possibility of an unexpected crisis. The Fed said the 34 banks collectively maintained at least 9.2% high-quality capital as a share of assets on one measurement, staying well above the Fed’s 4.5% minimum even after being pounded by a severe economic downturn. The Fed changes the details of its recession scenarios from year to year. Credit cards were one trouble spot for banks, with loan losses rising 9% from last year’s test to $100 billion. U.S. card performance has recently been weakening at several lenders, driven in part by an increase in subprime borrowing. Fed officials said they were finding higher delinquency rates in bank card portfolios at the same time that card lending was increasing. A new bar for banks to clear in this year’s test was the supplementary leverage ratio, which applied to the largest and most complex banks. That measure, which comes into effect in 2018, is meant to indicate whether banks also hold sufficient capital to cover their off-balance-sheet exposures. That includes derivatives contracts, a big cause of the panic of 2008. A handful of banks, including Morgan Stanley and Goldman Sachs Group Inc., fell within a couple percentage points of the minimum for that ratio during the Fed’s hypothetical scenario. That could end up limiting their shareholder payouts. In addition to Thursday’s public results, banks also learned privately whether their individual plans to return capital to shareholders would push them below the Fed’s minimum required threshold. If that happens, they may take a one-time shot at cutting their request for dividends or buybacks to stay above the Fed’s minimum requirement. This entry was posted in Economy, FInancial on May 31, 2017 by admin. Federal agencies must step back from, and leave alone, the only source of true economic growth: Private Enterprise, Private Capital and individual initiative. It is a mistake to allow one’s fear of the unknown to drive the nation to ever greater federal control over our lives. There is no doubt the Federal Reserve is the 900 pound gorilla in the room. Their slightest move influences the market. Is that wise? Has anyone asked what impact Fed Reserve actions have on markets and on the economy? For instance, the Fed printed $1.75 Trillion, in QE in 2009, to save TBTF banks by purchasing toxic MBS from their books. That in turn was a bailout of Congressional action with sub-prime lending through Fanny and Freddie. After all that, the nation is left with $4.5 Trillion in excess Fed balance sheet and we are now concerned about how to drain that excess from the market. Why did the Fed Reserve not think of those consequences when they printed $4,5T? Second question: what impact did the Fed have on the economy? The past eight years, in spite of massive federal monetary intervention, have resulted in the most pathetic post-recession growth in GDP in history. Third question: do we really want a more activist Federal Reserve Monetary Policy in light of their past actions? Just because people don’t understand what the fed does or the consequences of their actions, is that any reason to bestow even greater power in this 900 pound Unknown? Articles like this, though well researched and intelligent, totally miss the point. It is not the Fed Reserves’ job to manipulate markets or direct the economy. Their tools are far too gross, too “nuclear,” to make markets. We have seen too many examples of the failure of excessive government: this is the path all Progressive/Socialist and Communist nations have gone. There is absolutely no safety in giving up individual freedom to an all-powerful federal agency. Federal Reserve officials grappling with the legacy of expansive stimulus would find it difficult to return to the central bank’s precrisis role on the sidelines of financial markets, analysts and central-bank watchers say. A long list of programs adopted to help foster economic growth, along with changes in money markets and bank regulation, have vastly expanded the Fed’s balance sheet and its involvement in markets. 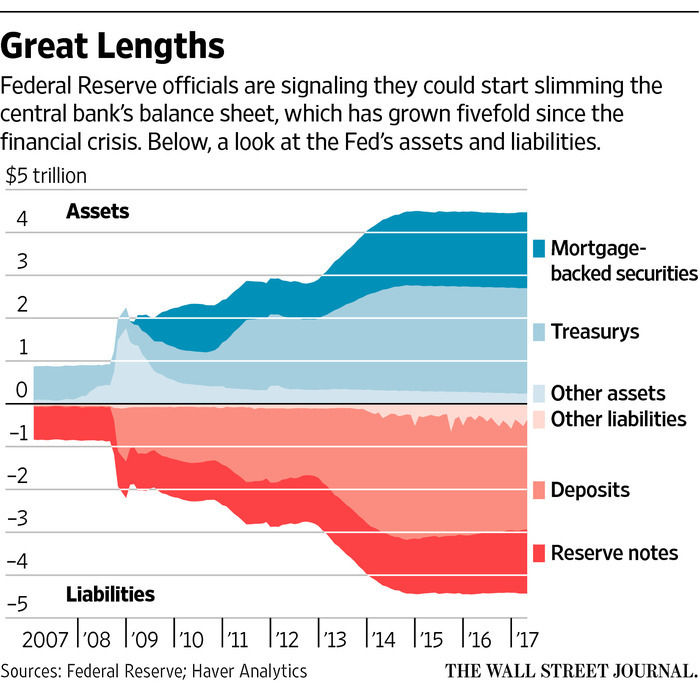 The Fed’s assets now total $4.5 trillion, up from less than $1 trillion a decade ago. Since 2013 the central bank has become one of the largest traders with U.S. taxable money-market funds, according to Crane Data. Many analysts and investors worry that significantly rolling back the Fed’s expansion, a course advocated by some in conservative circles, risks disrupting markets and the economy at a time when growth remains tepid. It would also reduce the connections the institution has built with a diverse set of Wall Street firms, beyond the group of banks it dealt with before the crisis. Investors are already assessing how stocks and bonds might react, when the central bank begins the latest stage of its yearslong retreat from stimulus—likely later this year—by ending the practice of reinvesting the proceeds of maturing bonds into new bonds. The Fed is scheduled to publish Wednesday the minutes of its latest policy meeting, where officials may have continued their debate over the mix of policy tools they plan to use in the future. Some Fed officials say they are attracted to maintaining parts of their current approach. Minutes of their November meeting also showed officials discussing the advantages of keeping something similar to the existing system in place, in part because it is simpler to operate than the precrisis one. The Fed hasn’t decided the issue, but its choices will be closely watched because its leadership is in transition. President Donald Trump is preparing to fill three vacancies on the Fed’s seven-member board. The White House hasn’t named its picks, but its choices could set Fed policy in new directions, including by limiting its role in markets. Republican lawmakers have also revived legislation to subject its decisions to greater public scrutiny, and some want monetary policy conducted by preset rules. New York Fed President William Dudley told an audience this month the portfolio isn’t likely to return to its precrisis size. Federal Reserve Bank of San Francisco President John Williams said this month the portfolio would be “significantly smaller” than it is today, but likely above $2 trillion in assets. The ultimate size will be closely tied to which system the central bank decides to use to control interest rates in the future. A handful of Fed officials have already begun questioning the wisdom of returning to the blueprint for controlling rates that they used before the crisis, although they have more time to decide. At the center of the debate is a special investment program the Fed launched in 2013. Through the facility, it lends money-market funds and others Treasurys in exchange for cash, temporarily draining excess cash from money markets and discouraging lenders from lending at rates below the target range for interest rates. Initially, the central bank said it would reduce the capacity of this so-called reverse repo facility “fairly soon after” it had begun raising short-term rates in 2015. Today, the Fed has no current plans to do so. Mr. Dudley suggested in April the Fed likely wouldn’t phase out the facility. Without the Fed repos, short-term rates could slip too low, and demand for Treasurys in the open market would surge, causing problems for money-market funds seeking alternative places to park cash overnight. Removing the program would “cause huge dislocations from a bond-market standpoint,” said Debbie Cunningham, chief investment officer for global money markets atFederated Investors . A balance sheet that is smaller than today’s, yet still substantial, would enable the Fed to keep the reverse repos around. It would also support the Fed’s foreign repos for overseas accounts, where weekly balances have averaged $250 billion, up from $30 billion precrisis, as well as the $1.5 trillion in currency outstanding and changing cash-management policies at the Treasury Department. If the Fed reduces its bond portfolio, the burden will be on private market participants to step in. In 2018, Morgan Stanley calculates investors may have to absorb $400 billion in mortgage bonds alone, a level not seen since 2008. In the past, such transitions were smoothed by the banks authorized to trade opposite the Fed, called primary dealers. Now those firms are grappling with new leverage rules, and some have less capacity. Communicating a strategy for unwinding risks some unintended signals. In 2013, when the Fed surprised investors with talk of slowing bond purchases, financial markets convulsed, thinking the Fed meant earlier rate rises than were expected. This entry was posted in Economy, FInancial on May 30, 2017 by admin. The Rule of Law is diametrically opposed to the Rule by Regulation. The ultimate Rule of Law is set down by our Constitution and governed by elected officials that we citizens choose, and fire, through voting. The Rule by Regulation is not governed by our Constitution, but is implemented by federal bureaucrats, most often on whim, but not on law. Further, Congress abrogated their singular right to make law when congressmen allow federal bureaucracies to make their own regulations. Dodd-Frank is the most recent example of this dereliction. The most notorious example was the Chevron Deference when congress allowed the EPA to unilaterally write law in the 1980’s. The Constitution, Bill of Rights and Amendments do one thing: they all limit the power of the federal government, not the rights of the citizen. This makes America, and its Constitutional Republic unique in the world: Our Rule of Constitutional Law limits the power of the powerful. The Rule by Regulation accrues power to employees of the federal government. Don’t confuse the Rule of Law with the lawless Rule by Regulation. Regulation is only one means of federal control over every aspect of our lives; the other is force of arms. There are numerous examples of the debilitating effect of central control and big-government: Communist Russia and Nazi Germany are prime examples. There is little doubt that Progressives / Socialists / Communists prefer Rule by Regulation over Rule of Law. As the Labor Department acts to revise the Fiduciary Rule and others, the process requires patience. President Trump has committed—and rightly so—to roll back unnecessary regulations that eliminate jobs, inhibit job creation, or impose costs that exceed their benefits. American workers and families deserve good, safe jobs, and unnecessary impediments to job creation are a disservice to all working Americans. As the Labor Department approaches this regulatory rollback, we will keep in mind two core principles: respect for the individual and respect for the rule of law. America was founded on the belief that people should be trusted to govern themselves. Citizens sit on juries and decide the fate of their fellow citizens. Voters elect their representatives to Washington. By the same token, Americans should be trusted to exercise individual choice and freedom of contract. At a practical level, this means Washington should regulate only when necessary. Limiting the scope of government protects space for people to make their own judgments about what is best for their families. The rule of law is America’s other great contribution to the modern world. Engraved above the doors of the Supreme Court are the words “Equal Justice Under Law.” Those four words announce that no one is above the law, that everyone is entitled to its protections, and that Washington must, first and foremost, follow its own rules. This means federal agencies can act only as the law allows: The law sets limits on their power and establishes procedures they must follow when they regulate—or deregulate. The Administrative Procedure Act is one of these laws. Congress had good reason to adopt it: In the modern world, regulations are akin in power to statutes, but agency heads are not elected. Thus, before an agency can regulate or deregulate, it must generally provide notice and seek public comment. The process ensures that all Americans—workers, small businesses, corporations, communities—have an opportunity to express their concerns before a rule is written or changed. Agency heads have a legal duty to consider all the views expressed before adopting a final rule. Today there are several regulations enacted by the Obama administration that federal courts have declared unlawful. One is the Persuader Rule, which would make it harder for businesses to obtain legal advice. Even the American Bar Association believes the rule goes too far. Last year a federal judge held that “the rule is defective to its core” and blocked its implementation. Now the Labor Department will engage in a new rule-making process, proposing to rescind the rule. Another example of a controversial regulation is the Fiduciary Rule. 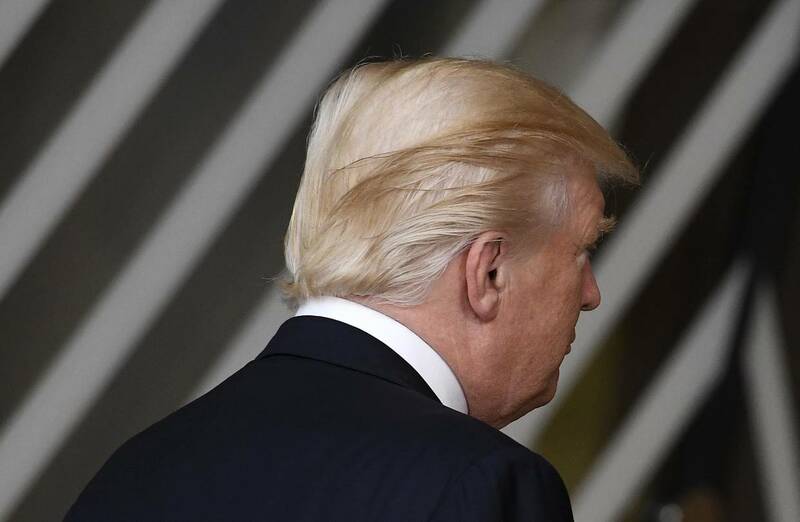 Although courts have upheld this rule as consistent with Congress’s delegated authority, the Fiduciary Rule as written may not align with President Trump’s deregulatory goals. This administration presumes that Americans can be trusted to decide for themselves what is best for them. The rule’s critics say it would limit choice of investment advice, limit freedom of contract, and enforce these limits through new legal remedies that would likely be a boon to trial attorneys at the expense of investors. Certainly, it is important to ensure that savers and retirees receive prudent investment advice, but doing so in a way that limits choice and benefits lawyers is not what this administration envisions. The Labor Department has concluded that it is necessary to seek additional public input on the entire Fiduciary Rule, and we will do so. We recognize that the rule goes into partial effect on June 9, with full implementation on Jan. 1, 2018. Some have called for a complete delay of the rule. We have carefully considered the record in this case, and the requirements of the Administrative Procedure Act, and have found no principled legal basis to change the June 9 date while we seek public input. Respect for the rule of law leads us to the conclusion that this date cannot be postponed. Trust in Americans’ ability to decide what is best for them and their families leads us to the conclusion that we should seek public comment on how to revise this rule. Under the Obama administration, the Securities and Exchange Commission declined to move forward in rule-making. Yet the SEC has critical expertise in this area. I hope in this administration the SEC will be a full participant. America is unique because, for more than 200 years, its institutions and principles have preserved the people’s freedoms. From administration to administration, respect for the rule of law has remained, even when Americans have been bitterly divided. Some who call for immediate action on the Obama administration’s regulations are frustrated with the slow process of public notice and comment. 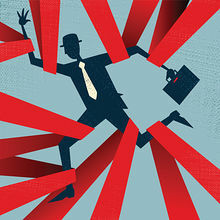 But this process is not red tape. It is what ensures that agency heads do not act on whims, but rather only after considering the views of all Americans. Admittedly, this means deregulation must find its way through the thicket of law. Casting aside the thicket, however, would leave Americans vulnerable to regulatory whim. The Labor Department will roll back regulations that harm American workers and families. We will do so while respecting the principles and institutions that make America strong. Mr. Acosta is secretary of labor. Appeared in the May. 23, 2017, print edition. This entry was posted in Economy on May 30, 2017 by admin. Ironic isn’t it, that we taxpayers pay these federally-employed bureaucratic elites through our private-sector work, through our taxes. In turn, these bureaucrats gather tremendous power over our very existence, through regulation and ignore our duly elected president, elected by us. Our nation is going through a pivotal battle of ideas: Will we continue federal tyranny or obtain individual rights. The battle for ideas is not between democrat and republican, its between big-government and individual freedom. The ‘threat’ that has elites quaking is his serious attempt to curb federal power and cut spending. A lobbyist friend who visited Capitol Hill recently came away horrified. “I now am ready to believe that the partisanship is so unhinged that it’s a threat to the Republic,” she writes in an email. This Washington hysteria comes at a time of full employment, booming stocks, relative peace and technological marvels like an electronic robot named Alexa who fetches and plays for you songs of your choice. What’s the fuss about? We all know the answer: Donald Trump. The Washington body politic has been invaded by an alien presence and, true to the laws of nature, that body is feverishly trying to expel it. These particular laws of nature demand rejection of anything that threatens the livelihoods and prestige of the permanent governing class. The “threat” that has Washington quaking is the first serious effort in a long time to curb federal regulatory power, wasteful spending, and a propensity to run up mountainous budget deficits and debt. That’s presumably what the voters wanted when they elected Donald Trump. Democrats—accurately regarded as the party of government—seem to fear that Mr. Trump might actually, against all odds, pull it off. What scandals would those be? There was of course the firing of FBI Director James Comey. Democrat Hillary Clinton went on TV to claim that Mr. Comey cost her the election. Mr. Trump fired Mr. Comey. Did Democrats praise the president? No, they want him impeached. Devious logic, but devious is a good descriptor of much of what goes on in this fight. Mr. Comey retaliated by leaking a “big scoop” to the Times—notes taken when Mr. Trump allegedly asked him to back off on the investigation of national security adviser Mike Flynn. But let’s recall the circumstances of this “investigation.” The Obama administration—possibly the FBI—tapped a phone conversation between Mr. Flynn and Russian Ambassador Sergey Kislyak. Then Mr. Obama’s minions used the raw data to “unmask” Mr. Flynn and get the retired general fired for not giving a full account of the discussion. Given that sorry record of political involvement, was Mr. Trump so wrong if he asked Mr. Comey to go easy? Russians aren’t popular in the U.S., for many good reasons. That has its uses for Trump baiters. Democratic claims that Mr. Trump conspired with the Russians to swing the November election led the Justice Department to appoint a special prosecutor, former FBI chief Robert Mueller, to investigate. But is this claim even slightly plausible? So far all we have are anonymous officials who claim that intelligence agencies know of individuals with connections to the Russian government who supplied WikiLeaks with hacked emails from the Democratic National Committee and John Podesta’s accounts. But these officials are still unwilling to go on the record. The Washington community knows how to fight back when it feels threatened. Leakers are having a ball, even if it has taken a lot of journalistic imagination to turn the most notorious leaks into “scandals.” Almost everyone in town has a stake in fending off the Trump threat: government workers and the businesses that serve them, public unions, lobbyists and their clients, owners of posh hotels and restaurants that cater to well-heeled visitors seeking government favors, journalists whose prestige derives from the power center they cover, academics who show politicians how to mismanage the economy, real-estate agents feeding on the boom—to name a few. It’s a good living, and few take kindly to a brash outsider who proclaims it is his mission to drain the swamp. Mr. Trump is on the attack and Washington is fighting back. Is the Republic in danger? Another question is how much danger will it be in if Mr. Trump loses? Appeared in the May 26, 2017, print edition. My heart hurts as I hear reports that Venezuelans have no toilet paper, coffee or food. Last month, Latina Magazine reported that hundreds of hungry Venezuelan women stormed across the border with Columbia in search of basic necessities and foodstuffs which are hard to find in Venezuela. This is what happens with centralized government and Socialism. Venezuela was once a thriving, prosperous society. Today, moms, sisters & daughters are standing up to guards with guns, just to find basic items for their families. This is what happens when politicians pass laws and ordinances that tax creativity, innovation and hard work while unelected bureaucrats institute rules and regulations that stifle and penalize small businesses and the American Dream. This is what happens in a society based on envy, divisiveness and self righteousness. Food shortages, lack of toilet paper and disruption of hopes & dreams are the tried and true results of socialist, centralized, progressive policies. These are the tried and true results of Hillary Clinton’s vision for America. As Maggie Thatcher opined, “The problem with socialism is that eventually you run out of other people’s money.” Then there is nothing left; no food, no hope and no toilet paper. Donald Trump has it right on most aspects of the economy. Lower taxes, reduce rules & regulations and get rid of the death tax. These three things alone will jumpstart the “new norm” sluggish economy that we have been living with the last eight years. Bigger economy, bigger pie, more tax revenues. When the 1% consists of individuals who have gotten rich because they provide goods and services that make people’s lives better and for which individuals freely trade their hard earned dollars, we should applaud the 1% and thank them for their service. There may be outliers in this 1% model that have gotten rich by nefarious means, however, they are just that, outliers. If a politician is using government policies, rules & regulations, to her advantage, to join the 1%, then we must question the character of the politician. If a politician has joined the 1% by selling access to the U.S. government, thereby hurting everyday hardworking Americans, then we must question her motives. If a politician rails that the 1% and corporations must “pay their fair share” while using her non tax paying, non-profit to create her own personal wealth, then we must question her objectives. The American Dream is based on the Idea that individuals, rich or poor, should be able to keep most of the fruits of their labor. Everyone must have “skin in the game” for an equal and just society. Government, all in (local, county, state & federal), should take no more than 20% of people’s earnings. This American Idea of small government, freedom to choose how to live one’s life and rule of Constitutional law created a vibrant middle class where everyday people like us can thrive and prosper. The American Dream has brought more people out of poverty than any other political system known to man. Each of must do what we can to preserve it. We have a choice this political season: no toilet paper Clinton or bigger economy Trump. This entry was posted in Economy on February 6, 2017 by admin. In 2007 I started a small business with just one employee and until the 2009 election I was holding my own. When the new president was elected it was the beginning of the end as new banking regulations took hold. Then the devaluation of the dollar hit and many of my customers felt the crunch. I tried to stay afloat as long as possible but in May of 2011 I closed the doors and that was it. I lost my business, my home, and all my savings. I do blame Obama and yes I did build it all by myself, thank you very much Mr. President. This is just one of many stories from around the U.S. we have heard about small business owners that did build their own businesses with their own capital, sweat and tears, only to lose it all in the face of over-regulations and poor fiscal policy. The economy matters to 100% of us. This entry was posted in Economy on February 4, 2017 by admin. In order to build something beautiful, sometimes you must completely tear down what stands in its way. If the football team isn’t taking you to the Super bowl, you trade them all in and bring in some fresh talent. If the house is old and decrepit you bring in wrecking ball, you tear it down, and build something beautiful. There are definitely times [that] a wrecking ball encourages a fresh start. There’s no doubt about that. But do you buy into the case that we must tear down capitalism, the free market, and savings accounts of our friends and neighbors in order to create a more perfect America in the future? Many politicians do, and they got the idea from Cloward & Piven, a couple of Columbia University professors in 1966. My name’s Molly Vogt, I’m an Americhick and I’d like to just take a quick moment to talk to you about how the followers of a Cloward & Piven strategy, also known as the “crisis strategy,” lead to the 2008 housing crash, and ask you to consider what it will affect next. Cloward & Piven activist’s said that we should work to sabotage and destroy the welfare system so that a political and a financial crisis can rock the nation, and rock it they did. How do you make more people dependent on the government? You take away their ability to financially take care of themselves. You make their homes unaffordable, take away their savings account by encouraging them to invest in something they can’t afford and then crashing the market. For this example let’s look at the housing bubble. Consider the decades of government incentives for low-income families to tie up their savings in a house they can’t afford. Remember the New Deal, Fair Housing Act, and many more after that. In the 90’s, President Clinton required banks to hold at least 50% of their home loans in subprime loans. That means they needed to lend money to families who were never going to be able to pay the money back at rates that were not sustainable and would certainly increase in the future. Did you ever stop to think perhaps there’s a reason private lenders and investors are more successful than the government? Because they’re investing their own money, so they actually measure the risk of an investment before making it. Sounds logical to me. When a bank is forced to lend their money to a great risk, how do they cover their shareholders? Well, I’ll tell you what they did. They packaged the subprime loans, rated them much safer than they actually were, and they sold them to every mom and pop 401k plan in the U.S. and across the globe. What was the end result? A 6 trillion dollar real estate value loss from 2007 to 2009. Then the housing crash lead to the Great Recession. Retail spending collapsed 8%. So, a family with a $30,000 net worth in 2007 equaled almost nothing only three short years later. What’s the point? The point is, I just want to ask you all to dig into the true intentions behind what seems like good intentions. Read Cloward & Piven’s strategy and see where else you see a crisis strategy being built. Tune in Sundays as the Americhicks get to the heart of the matter on issues affecting your family every day.